During a regular radiographic analysis, we noticed a problem with one of Cheryl's front teeth. She had no symptoms, but had to have a tooth removed because of “internal resorption". Cheryl showed general wear on her front teeth, leading to improper proportions to her smile. The color of her teeth was not appealing to her, and she had many unaesthetic bonded fillings. 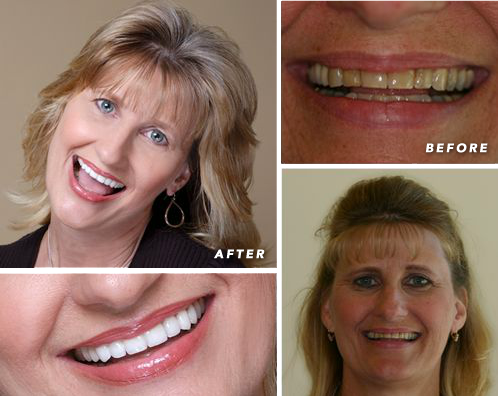 We were able to resolve her problem and create a new wonderful smile for her. We corrected the proportions of her teeth by changing the length, which improved her smile line. In addition, we removed all the unattractive bonding, and created a color that was aesthetically pleasing. I've always been self-conscious about my teeth. I wanted a Perfect Smile. One of the things I always notice about people is their smile. They always say a first impression is a lasting one. Dr. Gombert made my smile look better than I ever imagined. He was very passionate about making me look great, and he did what he promised – and without any pain. People now comment on how beautiful my teeth look. I want to thank Dr. Gombert and Parkside Dental for making me feel so comfortable throughout this whole process.